A dental abscess can be incredibly painful and can even affect the teeth and gums involved. There are two different types of abscesses that can occur in the mouth: periapical (at the root of a tooth) or gingival (on the gums). 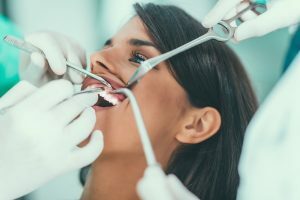 At Ascent Dental Group, we can perform a comprehensive exam and x-rays to determine if you have an abscess that needs treatment. A dental abscess is a buildup of bacteria and pus that forms inside the teeth or gums and cause infection. Abscess treatment varies from one patient to another, but most often antibiotics are prescribed to help get rid of the infection fully. If you have a gingival abscess, this may need to be drained along with having a course of antibiotics. The point of all abscess treatment plans is to completely clear the infection and get rid of the bacteria and pain. Severe throbbing pain in a localized area that can radiate into the jawbone, neck or ear. If you are in need of abscess treatment, contact our office immediately and one of staff members can assist you further.